Corcovado National Park established on October 24, 1975 is located near the port of Puerto Jimenez, across from the bay of Golfito on the pacific south coast on the Osa Peninsula and has 54,039 Terrestrial hectares and 2,400 Marine hectares. In 1975, 300 farmers living in the area were compensated for their land and relocated elsewhere. Until 1978, there was little access by land to the Osa Peninsula and the population in the region was scarce. 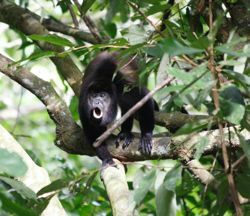 Since 1978, the Corcovado National Park has been destined exclusively for conservation, scientific investigation, environmental education and eco-tours. Corcovado Park is one of the rainiest regions in the country with records of up to 5,500 mm. of rainfall on the highest peaks. 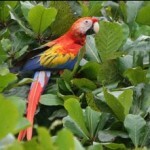 The park is very popular with tropical ecologist and eco-tourists that love the abundance of plant and wildlife. It offers 5 ranger stations which handle several services. The Park stations can assist with tent sites, food, helicopter services in emergencies and general information. >> Ready for adventure? Learn more about our Corcovado Tour offers! Famous for being–the Amazon of Costa Rica—the Corcovado National Park is the largest stronghold of primary forest on a Pacific coastline, and is famous for holding 3% of the biodiversity on this side of the planet. Some say that it is “the most biologically intense place on Earth” and it is widely considered the crown jewel in the extensive system of national parks and biological reserves spread across the country. In Corcovado visitors can witness the unique combination of marine and land ecosystems. There are several hiking trails through the park, many of which are long, and take many hours to travel taking visitors to the most deserted and pristine rainforest wilderness with spectacular displays of nature. The area holds thousands of species of flora and fauna, many unique to the area and others which have disappeared from other regions or are in danger of extinction. Approximately, 6,000 insects (including the 123 different butterflies discovered so far), 500 trees (a fourth of all the tree species that exist in Costa Rica), 367 birds, 140 mammals, 117 amphibian and reptiles, and 40 freshwater fish species live here in coexistence. In this park you will find the biggest tree in all the country, an enormous silk cotton tree that reaches a height of over 70 meters. Studies carried out in the park have recorded 20 species of saurians, 33 of ophidians or snakes, 48 of toads and frogs, and 7 of turtles, besides salamanders, crocodiles and caimans. 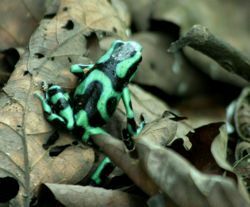 Three species of amphibians that are especially noteworthy are the glass frogs, which are so transparent that their internal organs can be seen through their skin, and the poison dart frog (endemic specie of Costa Rica). The Llorona beach is a frequently used nesting site for marine turtles: olive ridley turtle, leatherback turtle, green turtle and hawksbill turtles. Main habitats found in the park: montane forest, cloud forest, alluvial plains forest, swamp forest, holillo forest, freshwater herbaceous swamp, mangrove swamp, and rocky and sandy vegetation. Birds found here: scarlet macaw (located in the park are large groups), king vulture, white hawk, short-billed pigeon, tovi parakeet, bronze-tailed sicklebill, keel-billed toucan, prevost cacique, plush tanager, great tinamou, Mexican tiger-bittern, and northern jacana, harpy eagle. Animals found here: tapir (endangered species), jaguar (endangered species), cougar (endangered species), ocelot (endangered species), giant anteater (endangered species), white-lipped peccaries, howler monkey, white-faced capuchin monkey, spider monkey, and squirrel monkey, American crocodile (endangered species).